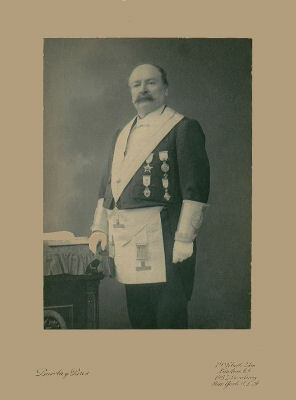 Walter WOOLGAR was born on the 15th November 1845 at Wimbledon in Surrey and is pictured here in his Masonic regalia. During his life, he was variously known as "Walter", "Richard" and "Walter Richard" which has made tracking his history more than usually complicated. His father was John WOOLGAR, a shoemaker and later Constable and Beadle of Wimbledon. John WOOLGAR fathered 16 children by his first wife Jane and then married Elizabeth FROST in 1837 and they had a further 7 children. Walter Richard WOOLGAR married Jane WHITBY on 22 Aug 1865 at St. Martin's, Leicester and they had three children.